In the document below, you can see the agenda for the April DA conference and get information about DA’s partners, among other things. There is always a certain dissociation when leftists gather at a Ritz Carlton hotel to discuss their commitment to the poor. 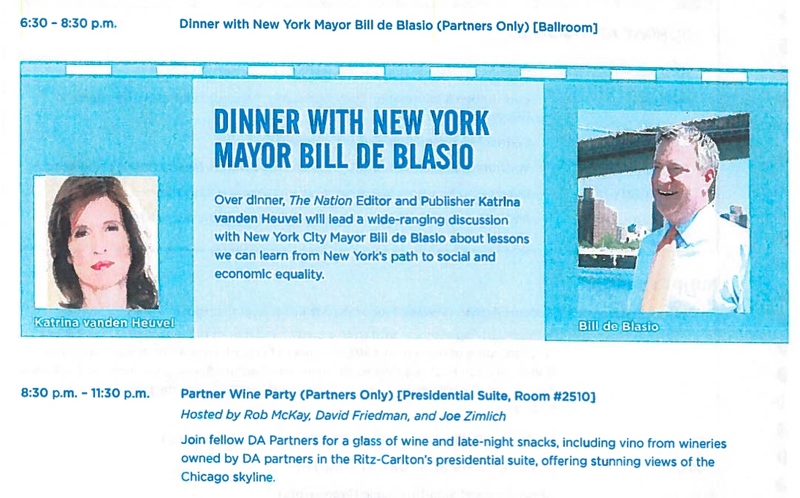 It is impossible not to laugh at this invitation to a dinner with Katrina vanden Heuvel, the heiress who bought and now runs the Nation magazine, a Communist publication, and New York’s newly-elected mayor Bill de Blasio. They will discuss “New York’s path to social and economic equality.” Sure: in the world to come, the hedge fund manager will share his income equally with the doorman, and Miss vanden Heuvel will divide her inheritance with New York’s poor. 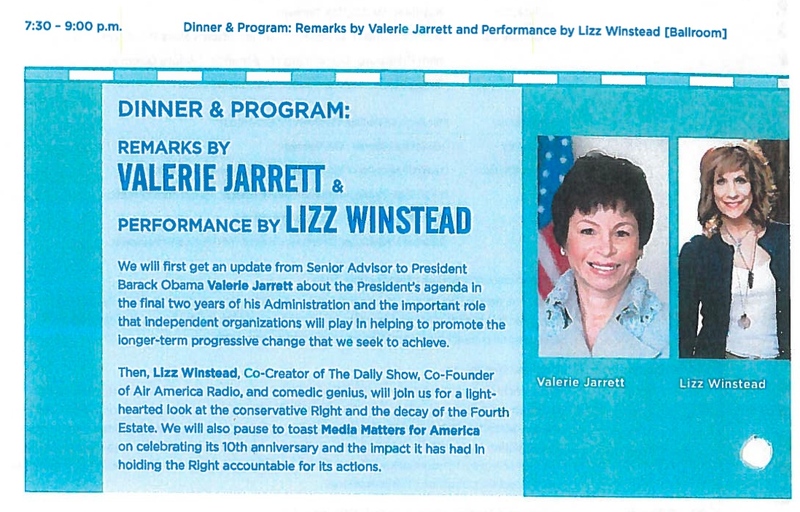 Note that Ms. Jarrett appeared along with Lizz Winstead, a comedian of sorts who founded the Daily Show, which, we are told, is the main source from which young people learn about current events. Entirely non-partisan, of course. The most interesting of the DA documents that have come to light is the one below. It contains DA’s “investment recommendations” for 2014. Not only does it list the recommended organizations, but it rates each organization in several categories, sets out the group’s budget for 2014, and shows how much of that budget should be contributed by the 100 members of the Democracy Alliance. One category in which DA rates the organizations is “Collaboration,” as DA believes that all left-wing groups should coordinate their activities for maximum political impact. Harry Reid has no problem with that, since they are Democrats. There is much information in this document, which I haven’t yet had time to digest fully. For example: have you ever wondered what Media Matters’ budget is? I can tell you: in 2013, it raised $13,820,000, of which $2,700,000 came from Democracy Alliance partners. Most of the rest, if I am not mistaken, was contributed by George Soros. DA notes that last year, Media Matters “partially met” its goal “to diversify funding and make organization more sustainable.” I assume that means that if one or two rich leftists die, David Brock is out of business. These documents place an enormous amount of information about America’s Left at your fingertips. We have no proprietary interest in them; on the contrary, you can read them and comment on them here or elsewhere, and anyone can embed them on his or her own web site. They deserve, I think, broad circulation, as a window on the contemporary American Left.